Tune in tomorrow night for a special performance by Stevie! America's Got Talent will crown a Season 11 champion Wednesday night, but there's already a clear winner: the show itself. The NBC talent competition (tonight and Wednesday, 8 ET/PT) is again summer's top-rated program, enjoying its biggest audience in five seasons (an average of 13.7 million viewers, up 10% from last year) and its best performance with young adults since 2013. Besides naming a winner, Wednesday's finale will feature performances byStevie Nicks, Jersey Boys and Il Volo. 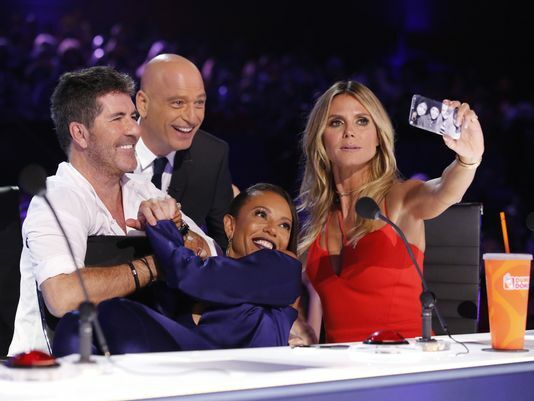 Judge Howie Mandel attributes the increased popularity to a rising level of talent, especially among singers, that has accompanied the arrival of AGT executive producer and former American Idol arbiter Simon Cowell as a judge, replacing Howard Stern. (They join Mel B and Heidi Klum). "Simon created more of a gravitas to the judging panel; it's not just a talent contest, but stars can be made," Mandel says, referring to performers such as One Direction,Susan Boyle and Fifth Harmony who have competed on Cowell's X Factor. Contestants "come on with hopes of not just doing well in this contest but having a career beyond this, and singing in front of Simon Cowell means more than it ever meant before." Mandel marvels at the youngest competitors, including 14-year-old opera singer Laura Bretan and this season's breakout performer, singer-songwriter Grace VanderWaal, who's just 12. "All these really young people, younger than ever before, are showing up and doing things at a level far beyond anybody three times their age," he says. . She "is not only an adorable, little ukulele-playing singer, but an amazing, already accomplished songwriter who has caught the ear of everyone in the business." The success of Cowell's pre-season goal of attracting more singers is reflected in the finals: Half the field consists of musical acts, including Brian Justin Crum, Sal Valentinetti and Linkin' Bridge. But the finale also features juggler Viktor Kee, magician Jon Dorenbos, contortionist Sofie Dossi, mime/comedian Tape Face (aka Sam Wills) and mentalist duo The Clairvoyants. "The variety is impeccable," says Mandel, who won't predict a winner but says VanderWaal, "regardless of whether she comes in first, second or third, will explode as having the biggest career out of these kind of shows since Carrie Underwood or Kelly Clarkson."